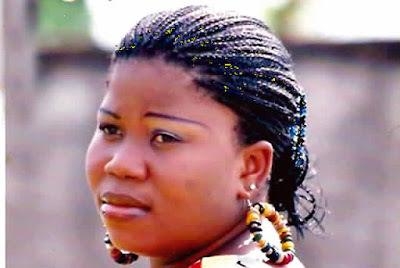 The life of 32-year-old Victoria Ekpe, pictured above, has been abruptly cut short after a drunk policeman, identified as Sergeant Edu Nkanu, who is also her neighbour at 11, Joseph Mkpa Street, Calabar, shot her to death. It happened in front of her 6-year-old daughter last Sunday. Narrating what happeed, a sister of the deceased, Elizabeth Bassey, who survived the bullet of the trigger-happy policeman, said, "On Sunday evening myself and my late cousin went out and came back by 8:30pm. She remained at the passage pressing her phone while I went in to change. By the time I came out she was still on her phone, and she asked me what was going on inside the room and I told her nothing. "At that particular time, Nkanu came back from an outing and we heard our mummy, who was outside, asking him what he brought from his outing. He told her he did not come home with anything. He left our mother and came to the passage where we were standing. "I asked him why he always gets drunk anytime he goes out. Immediately, he turned and brought out a pistol from his pocket, cocked it and pointed it at me saying, ‘This is what I brought from the party.’ I got scared and ran inside the house. “But I did not come out immediately until I heard Blessing screaming, ‘Uncle you have killed my mummy,’ that was when I came out, and behold, my sister was lying down dead, blood was gushing out from the side of her neck. "That was when I held him and started shouting before people gathered and managed to collect the gun from him. I don’t understand why a policeman would rather take people’s lives instead of saving lives. “The policeman has been arrested; he is in our custody and we are going to deal with him decisively because the gun that he used to shoot the deceased is not our gun. "It is a locally made pistol; so he is going to tell us where he got that gun from and who ordered him to shoot an innocent woman. There was no quarrel between them as we were told.